Tour takes approximately 2 hours. For an unforgettable 4x4 adventure, embark upon the Bigfoot Discovery Expedition! Guests will head to Bigfoot on the Strip in Branson, MO where they will be whisked away for an unforgettable exploration of the beautiful Ozarks Mountain area where Bigfoot has been spotted many times! Climb aboard the 28-seat, open-air safari-style truck and prepare for a thrilling and informative all-ages adventure you won’t soon forget. Your tour begins with a fun ride to Bigfoot Farms. This ten-minute journey treats guests to views of some of Branson’s most prominent attractions. See favorite places such as the Bigfoot Tower (the tallest structure in Branson), Butterfly Palace, Acrobats of China theater, Silver Dollar City, and Inspiration Tower! Plus, you’ll be afforded some fantastic views of the 76 Strip, Branson’s most famous area adorned with all of the great theaters and more that call the Ozarks home. Also along the way, visitors will be able to learn about the history of Branson. Hear all about the original Baldknobbers, the renowned Shepherd of the Hills novel, homestead, and outdoor theater, Branson Landing, and Parakeet Pete’s Zipline. The ride itself is adrenaline-pumping as guests will feel the wind in their hair all the way to the Bigfoot Farms! Upon arrival to the farm, safari-goers will be treated to the sights of some beautiful Scottish Highland Cattle. 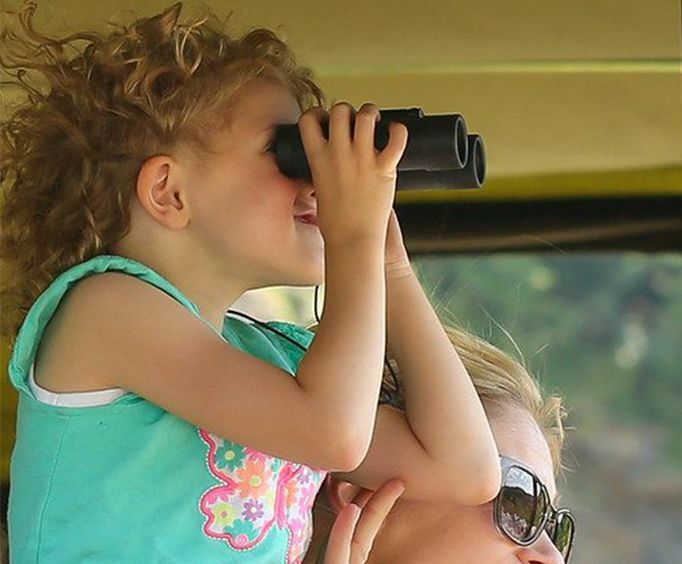 Learn all about these magnificent creatures while observing them upon their 450-acre farm home. As well as getting to know them, guests can get the opportunity to feed them with provided pellets. Any and all questions can be answered by the tour guide who is extremely familiar with the creatures which are used for both food sourcing and breeding. 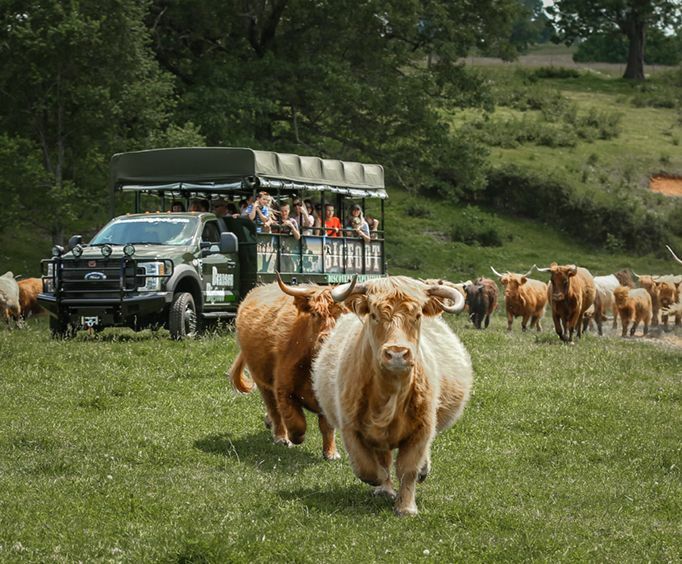 These cows hail from one of the largest Scottish Highland Cattle producers in the Midwest, so a visit with these bovine celebrities is sure to be a wonderful one. The most fun and thrilling part of the tour is definitely the off-road adventure! Journey through a beautiful wooded area where the driver will expertly navigate through twists and turns along the beautiful cliffside. Some stunning views await as well as plenty of unique information about the farm and the Bigfoot sightings that have occurred here. Learn how the Native Americans in the area interacted with these elusive ‘hairy people’, hear the stories of the cave-dwelling moonshine makers, and uncover the legends that have turned this area into well renowned Bigfoot territory. Visitors might even see Bigfoot itself! Keep your eyes peeled, because you definitely do not want to miss out. As well as potential sights of Bigfoot, guests may be able to see some stunning local wildlife as well. From lizards and snakes to birds, squirrels, deer, and turkey, these woods are a prime location for animals of all shapes and sizes. Once the Bigfoot expedition is completed, guests will be transported back to Bigfoot on the Strip where they can choose to have a blast with some extra, kid-friendly Bigfoot-themed activities! End your day with some fun in the Bigfoot Arcade, a trek in Bigfoot’s Adventure Maze and maybe even a dive off the Monkey Jump. For braver visitors, the Bigfoot Action Tower is the place to be! With plenty of adventure to be had on the Bigfoot Discovery Expedition, you will want to bring along the entire family! Just be prepared for an encounter you will never forget in the beautiful Ozark mountain area. Approximately how long could a customer plan to spend at Bigfoot Discovery Expedition? The Expedition is approximately 2 hours long. There is a gift shop, arcade, mini-golf, and more onsite at the Bigfoot on the Strip meeting place. For what ages is Bigfoot Discovery Expedition appropriate? Is parking available at Bigfoot Discovery Expedition? Is it free? We had a great time!! Would highly recommend. This was an enjoyable trip and we saw some beautiful scenery that we wouldn’t have seen otherwise. "Great time well worth it." Great time well worth it.